If governments took decisions on infrastructure based on making people, communities and the environment healthier, how would they look? What demands would we make of them? Imagine if public bodies had a legal obligation to safeguard the wellbeing of future generations when they made decisions. Well, in 2015 the Welsh Government passed a pioneering new Act legislating exactly that. The practical implementation of this type of legislation, balancing competing objectives across areas such as jobs, the environment, and health is not easy, but the ambition is for a fairer, healthier, and more environmentally friendly future. NEF Consulting was asked to assess the proposal for an extension to the M4 motorway around Newport, and the potential alternatives, against the criteria of the Well-being of Future Generations Act. The Future Generations Commissioner wanted to ensure that the preferred option, termed ‘the Black Route’, represents the best value towards achieving the seven wellbeing goals set out for Wales. The Black Route will cost around £1.4 billion, involves 14 miles of new motorway and will reduce average journey times by 3-5 minutes, rising to 10 minutes by 2050. These time savings, we are told, will generate at least £800 million in benefits to individuals, and at least £700 million in benefits to businesses. Not un-incidentally, the scheme will also plow through four protected areas (Sites of Special Scientific Interest) as it crosses the Gwent Levels, a region known for being “rich in both historical and natural heritage”, but as you can probably tell from my tone, this just one of many reasons why I think this project is a wrong’un. Looking just at the four local authorities most directly affected by the scheme (Newport, Monmouthshire, Cardiff, and the Vale of Glamorgan) we estimate that 26% of the population (approximately 116,000 adults) will receive virtually no benefit from the scheme due to living in a household which does not own a car. A further 12% of the adult population will receive a reduced benefit as, while they live in car owning households, they are not drivers themselves. While some of these individuals may benefit from slight improvements in their bus and taxi journey times, there are far better ways to serve their needs than building a new motorway. The entire case for the Black Route is built on the small time savings achieved by car drivers and passengers travelling on and in the vicinity of the motorway. National data shows that the people who drive the most and who commute the furthest are the wealthiest people in Britain. 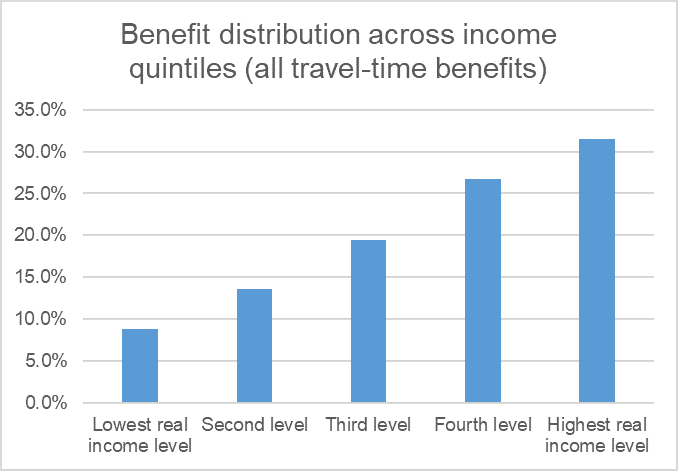 In fact, we estimate that of the £855 million of personal travel time savings attributed to the Black Route, £269 million will accrue to the top 20% of earners, and only £74 million to the bottom 20%. That’s 3.6 times as much ‘benefit’ for the highest earners than for the poorest. In other words, this proposed £1.4 billion investment is mostly about saving rich people time. Time saving for the rich forms the basis of a series of major infrastructure proposals. Heathrow was a colossal example, and High Speed 2 is a biggie. Construction of the Black Route will involve the emission of over 500,000 tonnes of CO2 equivalents. The Welsh government claims those initial emissions will be offset by emissions savings in later years, as cars will spend less time sitting in congestion – but they also say that the scheme will only become carbon neutral in 2072. Even if we accept the ropey assumptions behind that laughably long-dated prediction, that’s hundreds of thousands of extra tonnes of CO2 in the atmosphere now, at precisely the point when we have to make radical cuts to meet our climate targets. And that’s before we analyse the government’s dodgy forecasts. In their contribution to the report our colleagues at the University of West England highlight the high risk that those “efficiency” savings will be lost over time, as new roads lead to new journeys. If that happens, this project could quickly rack up the emissions. The government’s 2072 estimate relies on annual carbon savings maintaining at a constant rate throughout the period. That’s frankly never going to happen. Even the government’s own astonishingly unambitious proposals are aiming for all new cars to be zero carbon by 2040. How will the scheme make efficiency savings on vehicle emissions if there are no more emissions to save? If this scheme is carbon neutral on my 82nd birthday I’ll forego my cake in penance. The government suggests that the Black Route will put 42,000 new vehicles on the motorway every day by 2037. There is also a very high, but so far unquantified likelihood that new vehicles will be encouraged onto the road, driven by people who might otherwise not have travelled, or would have taken public transport. Studies show the health cost of encouraging inactivity. They estimate that 2.5 hours per week of moderate physical activity reduces the incidence of depression in the population by 4.1% – I am guessing sitting in a car on a motorway doesn’t. This statistic really comes home when you look at Sustrans new estimates (see page 36 of our joint report) on how else we might spend £1.4 billion. In fact you only need an investment of £118 million in the area around the proposed new motorway to generate an additional 3 million walking trips per year, and 600,000 cycling trips. Not bad value, and in this case the multiplier benefits would be to local businesses and communities instead of wealthy commuters and multinationals. A key activity seeded by the Future Generations Act was the community-led creation of Local Well-being Plans for every local authority in Wales. Encouraging cars onto the road is clearly at odds with the objectives set out in the well-being plans of local authorities around the new section of motorway. Newport’s plan states that they want to “create an environment where public transport, walking and cycling is prioritised”. Given the M4 bypass is as much a plan to improve movement of cars across Newport as it is between cities, this seems contradictory. Similarly, Cardiff want “investment in public transport systems, cycling infrastructure and cleaner vehicles, alongside support for behaviour change”. The M4 is likely to create behaviour change, but in the opposite direction to that desired by Cardiff’s community stakeholders. The Future Generations Act – are we serious about it? All of the above weren’t just individual oversights. 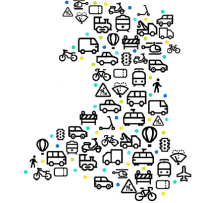 Appraisals of the Black Route, and the alternatives, seem not to have met the requirements of the Welsh government’s official guidance that transport projects must be appraised against the objectives of the Well-being of Future Generations Act. 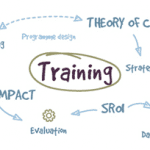 These include explicit consideration of the project’s implications for public mental health, socio-economic inequality, access and participation in sports, arts, and recreation, and healthy and resilient ecosystems. The latest iteration of this guidance was released after the options appraisal was completed but, given the size, cost and significance of the Black Route (and the official guidance on transitional arrangements given here), we believe there is cause to extend the appraisal process to consider these additional criteria, as well as others set out in our full report. Had the Black Route been appraised against these criteria, we argue that its overall desirability would have declined considerably. Is the M4 extension a good deal for future generations? The proposal for a new motorway bypass around Newport is a bad one for current, never mind future generations, particularly when seen in the context of how £1.4 billion might otherwise be spent: investment in the South Wales Metro, huge upgrades to public and active (walking and cycling) travel infrastructure, or rollout of energy efficiency initiatives and renewable energy projects. Among these alternatives are many options that will do more to provide jobs and services to the people who need them most, and to connect and revitalise local communities in South Wales.